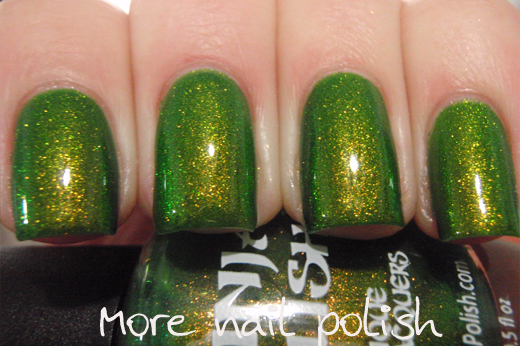 Today I have a couple of colour shifting shimmers for you from Ninja polish. These two polishes are in the same family as Mystic Glacier and Divinity, in that they have a shimmer that changes colour depending on the viewing angle, and of course they all have a different base colour. 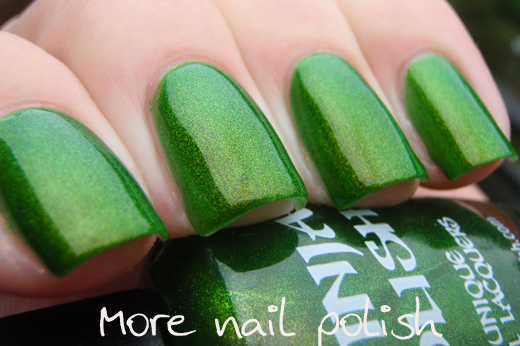 Shillelagh - a delicious bright green jelly polish with a heavy rich golden shimmer that shifts to green. I love that this doesn't require any base colour and it's totally opaque on it's own at two coats. Application is super easy and dry time is pretty good. 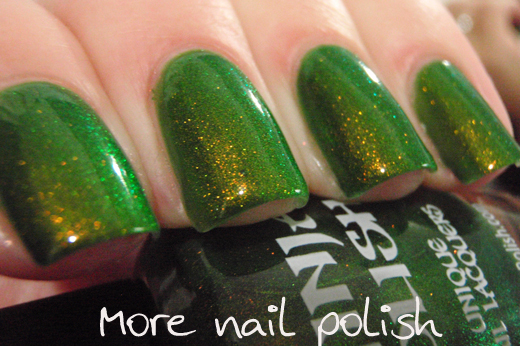 Because the base colour is green, it's a little difficult to capture the green shimmer, but you can see it on the alternate light source, particularly on the fourth picture. 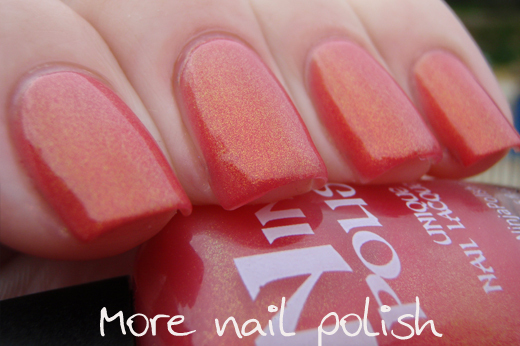 Pacific Coral - A soft but bright coral pink shade that has a magical golden shimmer that shifts to green. 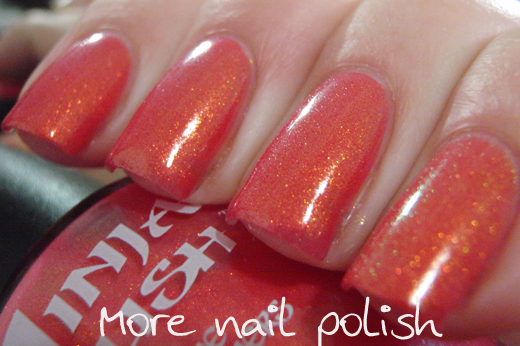 Again, no undie polish required when wearing this as you get perfect coverage with two coats. I love that these polishes are so jam packed with colour shifting shimmer, it's not just a light sparkle but a really dense and obvious shimmer, with the added extra of the colour shift. I also love that colour shifting shimmers like this are now so much easier for everyone to get. 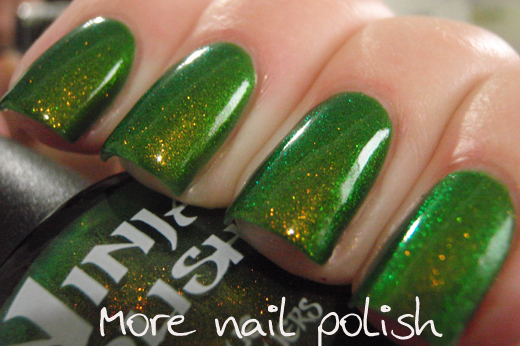 Remember those old Liquid Euphoria colour shifting shimmer polishes that we all wanted so bad, then came the colour morphing powders and top coats that we made. Well here is the next step. An indie brand that has used those color shifting pigments with various different base colours to create a collection that Liquid Euphoria would be proud of. 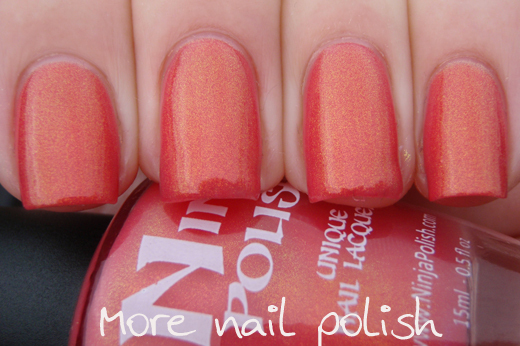 These polishes are only available from Ninja Polish. These two colors are right up my alley! Seems like a Ninja Polish haul needs to happen soon, I love their polishes. That green is just amazing! They are both fabulous! Pacific Coral is amazing. Wow, these are beautiful! Shillelagh is magical, and Pacific Coral looks like a fresh grapefruit!